Firewall Builder is multi-platform firewall configuration and management tool. 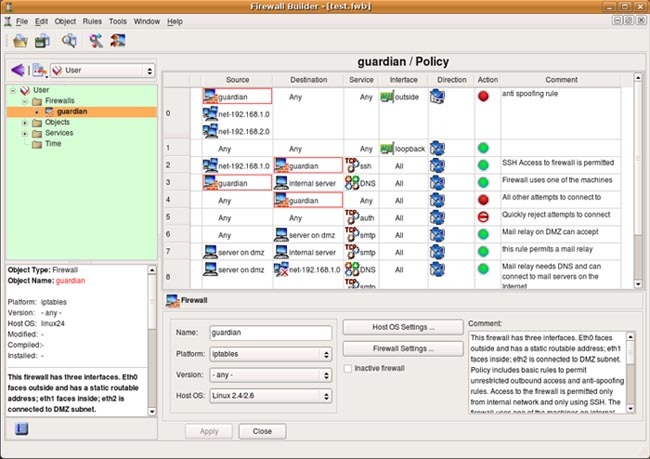 It consists of a GUI and set of policy compilers for various firewall platforms. Firewall Builder uses object-oriented approach, it helps administrator maintain a database of network objects and allows policy editing using simple drag-and-drop operations. It currently supports iptables, ipfilter, OpenBSD PF as well as Cisco PIX and Cisco IOS extended access lists. * Being truly vendor-neutral, Firewall Builder can generate configuration file for any supported target firewall platform from the same policy created in its GUI. This provides for both consistent policy management solution for heterogeneous environments and possible migration path. * Policy compiler for PIX, which recently has been released under GPL, allows Firewall Builder to function as a sophisticated policy management software for Cisco PIX firewall with access to all functions of PIX including newest features added in v7.x. * Policy compiler for Cisco IOS Access Lists adds support for router access lists and turns Firewall Builder into complete solution for the multi-tiered network security. * Firewall Builder allows for management of multiple firewalls using the same network object database. Qweas is providing links to Firewall Builder 4.2.0 as a courtesy, and makes no representations regarding Firewall Builder or any other applications or any information related thereto. Any questions, complaints or claims regarding this application Firewall Builder 4.2.0 must be directed to the appropriate software vendor. You may click the publisher link of Firewall Builder on the top of this page to get more details about the vendor.